Donepezil-mediated eACh activity in vitro. After being cultured in serum-free EBM-2, HUVECs were treated with donepezil at a concentration of 10 umol/L for 24 hours. E and F: Representative images (x 400 magnification) of anti-ChAT and -VAChT immunofluorescence. Scale bar: 50 um. 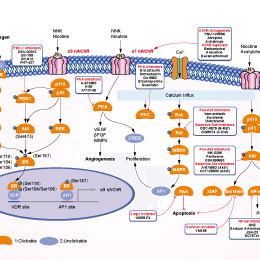 ChAT indicates choline acetyltransferase; eACh, endothelium-derived acetylcholine; EBM-2, endothelial basal medium 2; HUVECs, human umbilical vein endothelial cells; PCR, polymerase chain reaction; VAChT, vesicular acetylcholine transporter. (-)-Huperzine A is a potent, highly specific and reversible inhibitor of acetylcholinesterase (AChE) with Ki of 7 nM, exhibiting 200-fold more selectivity for G4 AChE over G1 AChE. Also acts as an NMDA receptor antagonist. Phase 4. Edrophonium chloride is the chloride salt of edrophonium, which is a rapid-onset, short-acting, readily reversible inhibitor of acetylcholinesterase. Corydaline is a bioactive alkaloid with various anti-acetylcholinesterase, anti-allergic, and anti-nociceptive activities found in the medicinal herb Corydalis Tubers. Nodakenin, a coumarin compound, acts as an AChE inhibitor that inhibits AChE activity in a dosedependent manner with an IC50 value of 84.7 μM. Huperzine B, a natural alkaloid existed in Lycopodium plants, is a novel acetylcholinesterase inhibitor and has neuroprotective effects. Chelidonine, a major bioactive, isoquinoline alkaloid ingredient in Chelidonium majus, exhibits anti-inflammatory properties and acetylcholinesterase and butyrylcholinesterase inhibitory activity. Jatrorrhizine chloride is the hydrochloride salt form of jatrorrhizine, which is an inhibitor of AChE with IC50 of 872 nM and demonstrates >115-fold selectivity for AChE over BuChE. Atropine Sulfate is the sulfate salt of atropine, which is a natural alkaloid anticholinergic agent and has potent antimuscarinic effects. Ethyl (triphenylphosphoranylidene) acetate may act as an inhibitor of cholinesterase that inhibits AChE and BChE. Donepezil is a piperidine based, potent, specific, non-competitive and reversible inhibitor of acetylcholinesterase (AChE) used for the treatment of mild to moderate dementia of the Alzheimer's type. Acotiamide is a novel acetylcholinesterase inhibitor with fundus-relaxing and gastroprokinetic properties. Amfebutamone (Bupropion) HCl is a selective norepinephrine-dopamine reuptake inhibitor with IC50 of 6.5 and 3.4 μM for the reuptake of dopamine and norepinephrine, respectively. Aclidinium Bromide inhibits human muscarinic AChR M1, M2, M3, M4 and M5 with Ki of 0.1 nM, 0.14 nM, 0.14 nM, 0.21 nM and 0.16 nM, respectively. Otilonium bromide is an antimuscarinic. Gallamine Triethiodide is a cholinergic receptor blocker with an IC50 of 68.0 ± 8.4 μM. Acetylcholine (ACh)-related protein expression in vivo. Choline acetyltransferase (ChAT) in the ischemic area were determined among 3 experimental groups. Data of Western blotting are represented as fold of control. Rivastigmine Tartrate is a cholinesterase inhibitor with IC50 of 5.5 μM, and used as a parasympathomimetic or cholinergic agent for the treatment of mild to moderate Alzheimer disease. Irsogladine is an anti-gastric ulcer agent that facilitates gap-junctional intercellular communication through M1 muscarininc acetylcholine receptor binding. Neostigmine Bromide is a reversible acetylcholinesterase inhibitor. Catharanthine inhibits nicotinic receptor mediated diaphragm contractions with IC50 of 59.6 μM. Hyoscyamine is an AChR inhibitor with IC50 of 7.5 nM. Dehydroevodiamine (DHE), a major phytochemical in fruits of Evodia rutaecarpa, can inhibit AChE. It has hypotensive and neuroprotective effects and modulates nitric oxide production. Itopride hydrochloride is an AChE inhibitor. The IC50 of itopride with AChE is 2.04 +/- 0.27 μM. Pirenzepine is an antimuscarinic agent which inhibits gastric acid secretion at lower doses than are required to affect gastrointestinal motility, salivary, central nervous system, cardiovascular, ocular and urinary functions. Palmatine, an isoquinoline alkaloid, has sedative, antidepressant, antioxidative, anti-ulcerative, antacid, anticancer, and anti-metastatic activities. Jatrorrhizine, one of the active constituents of Coptis chinensis Franch, has multiple bioactivities, such as hypoglycemic, antimicrobial, and antioxidant activities. It is an inhibitor of AChE with IC50 of 872 nM and demonstrates >115-fold selectivity for AChE over BuChE. Vinblastine sulfate inhibits microtubule formation and suppresses nAChR activity with IC50 of 8.9 μM in a cell-free assay, used to treat certain kinds of cancer. Rivastigmine is a cholinesterase inhibitor with IC50 of 5.5 μM. It inhibits acetylcholinesterase (IC50 = 4.15 µM) and butyrylcholinesterase (IC50 = 37 nM). Harmaline, a natural occurrence β-carboline alkaloid, is a central nervous system stimulant and an acetylcholinesterase (AChR) inhibitor; also inhibits histamine N-methyltransferase. Lycorine is a toxic crystalline alkaloid found in various Amaryllidaceae species that weakly inhibits acetylcholinesterase (AChE) and ascorbic acid biosynthesis. Trihexyphenidyl hydrochloride is an antiparkinsonian agent of the antimuscarinic class. Adiphenine HCl is a nicotinic receptor inhibitor with IC50 of 15 μM, used as an antispasmodic drug. Galantamine is a phenanthrene alkaloid and a reversible, competitive acetylcholinesterase inhibitor with IC50 of 0.35 μM, exhibits 50-fold selectivity against butyryl-cholinesterase. It is studied as a treatment for Alzheimer's disease and other central nervous system disorders. Acotiamide Hydrochloride is the hydrochloride salt form of acotiamide, a prokinetic agent with gastrointestinal (GI) motility-enhancing activity. It is a new orally active selective acetylcholinesterase inhibitor. Pralidoxime Iodide (2-PAM) is an antidote approved for reactivation of inhibited acetylcholinesterase (AChE) in organophosphate poisoning. Pralidoxime is an antidote to organophosphate pesticides and chemicals; An acetylcholinesterase (AChE) reactivator. Tiotropium Bromide hydrate is a monohydrate of tiotropium bromide (Spiriva; Tiova; BA 679BR; tiopropium) that is an anticholinergic and bronchodilator and a muscarinic receptor antagonist. Pancuronium dibromide is a competitive nicotinic acetylcholine receptor antagonist, used as a muscle relaxant. Tolterodine tartrate is a tartrate salt of tolterodine that is a competitive muscarinic receptor antagonist. Scopolamine N-Oxide is a muscarinic antagonist used to study binding characteristics of muscarinic cholinergic receptors. Clidinium Bromide is an anticholinergic drug. Revefenacin (TD-4208) is a potent, lung-selective, long-acting muscarinic antagonist that may be for the treatment of respiratory disease. Nanofin is a ganglion blocker alkaloid having nicotinic acetylcholine receptor antagonist action. It has antihypertensive effect used for mild to moderate hypertension. Methylbenactyzine Bromide is a kind of muscarinic cholinergic receptor antagonist with antispasmodic activity. Fesoterodine Fumarate is a prodrug of 5-hydroxymethyl tolterodine that is a muscarinic AChR receptor antagonist, used to treat overactive bladder syndrome. Oxybutynin is a competitive antagonist of the M1, M2, and M3 subtypes of the muscarinic acetylcholine receptor, used to relieve urinary and bladder difficulties. Solifenacin succinate is a urinary antispasmodic of the antimuscarinic class. Ipratropium Bromide is an antagonist of M3 type muscarinic acetylcholine receptors, used for the treatment of chronic obstructive pulmonary disease (COPD). Trospium chloride is a competitive muscarinic cholinergic receptor antagonist. Methscopolamine is a muscarinic acetylcholine receptor blocker. Scopolamine HBr is a competitive muscarinic acetylcholine receptor with an IC50 of 55.3 nM. 5-hydroxymethyl tolterodine (PNU 200577) is a new muscarinic receptor antagonist with Kb of 0.84 nM. Homatropine Methylbromide is muscarinic AChR antagonist, inhibits endothelial and smooth muscle muscarinic receptors of WKY-E and SHR-E with IC50 of 162.5 nM and 170.3 nM, respectively. Homatropine Bromide is an muscarinic AChR antagonist, inhibits endothelial and smooth muscle muscarinic receptors of WKY-E and SHR-E with IC50 of 162.5 nM and 170.3 nM, respectively. Flavoxate is a muscarinic AChR antagonist with IC50 of 12.2 μM. Orphenadrine Citrate is a skeletal muscle relaxant, it acts in the central nervous system to produce its muscle relaxant effects. Diphemanil Methylsulfate is a quaternary ammonium anticholinergic, it binds muscarinic acetycholine receptors (mAchR). Pentoxyverine Citrate is an antitussive (cough suppressant) commonly used for cough associated with illnesses like common cold. Benactyzine hydrochloride is a centrally acting muscarinic antagonist. It is used as an antidepressant in the treatment of depression and associated anxiety. Hexamethonium Dibromide is a selective antagonist of neuronal-type nicotinic AChR in ganglia. Glycopyrrolate is a muscarinic antagonist used as an antispasmodic, in some disorders of the gastrointestinal tract, and to reduce salivation with some anesthetics. Umeclidinium bromide is a long-acting muscarinic antagonist approved for the maintenance treatment of chronic obstructive pulmonary disease (COPD). Oxybutynin is an anticholinergic medication used to relieve urinary and bladder difficulties. Diphenidol HCl is a potent antagonist of muscarinic M2 and M3 receptor with pKb of 6.72 and 7.02, respectively, used in the treatment of vomiting and vertigo. Tropicamide is an anticholinergic and a muscarinic receptor subtype M4-preferring antagonist with IC50 of 8.0 nM. PNU 282987 is a potent agonist of α7-containing neuronal nicotinic acetylcholine receptors with Ki value of 26 nM for the rat receptor. The chemical compound Acetylcholine Chloride is a neurotransmitter in both the peripheral nervous system (PNS) and central nervous system (CNS) in many organisms including humans. Varenicline Tartrate is a nicotinic AChR partial agonist, used to treat nicotine addiction. Bethanechol chloride is a selective muscarinic receptor agonist without any effect on nicotinic receptors. Arecoline is a muscarinic acetylcholine receptor agonist. Arecoline affects expression of epithelial-mesenchymal transition-related genes in a dose-dependent manner. Expression of epithelial-mesenchymal transition-related genes (CK19, E-cadherin, N-cadherin and vimentin) in HaCaT cells was determined by western blotting and the results were quantified. Data shown are means ± SD, *P<0.05, **P<0.01, ***P<0.001. CK19, cytokeratin 19. Pilocarpine HCl is a nonselective muscarinic acetylcholine receptor agonist used to produce an experimental model of epilepsy. Succinylcholine Chloride Dihydrate is a nicotinic AChR agonist and also acts as a depolarizing neuromuscular blocker. Nitenpyram is a nicotinic acetylcholine receptor (AchR) agonist, used as veterinary medicine to treat parasites of livestock and pets. LY2119620 is a specific, and allosteric agonist of human M2 and M4 muscarinic acetylcholine receptors. Choline chloride is a quaternary ammonium salt used as an additive for animal feed. It is important as a precursor of acetylcholine, as a methyl donor in various metabolic processes, and in lipid metabolism. Decamethonium Bromide is a nicotinic AChR partial agonist and neuromuscular blocking agent. Methacholine is a synthetic choline ester that acts as a non-selective muscarinic receptor agonist in the parasympathetic nervous system but has little effects on the nicotinic receptors. BQCA is a highly selective positive allosteric modulator of the M1 muscarinic acetylcholine receptor (mAChR). Morantel is a positive allosteric modulator of neuronal nicotinic acetylcholine receptors (nAChRs). C) A summary: MCAO-induced infarct volumes were significantly smaller in treated vs. untreated animals: p=0.0147 (n=10; two-tailed, the Mann–Whitney U-test). The results are presented as mean+S.E.M. Vecuronium is a non-depolarizing neuromuscular blocking agent, used for skeletal muscle relaxation during surgery. Dextromethorphan is an antitussive (cough suppressant) drug of the morphinan class with sedative, dissociative, and stimulant properties (at higher doses).